Whirligigs, also known as whirlybirds and whirliblades, are pieces of folk art with one or more moving parts. The simplest whirligig is a pinwheel, which when held to the wind turns and shows an array of colors. Traditionally, whirligigs are made of wood and depict people engaged in rural activities, like milking a cow, waving from a tractor, chopping wood, feeding animals or paddling a boat. Regardless of what kinds of actions they depict, all whirligigs operate in the same way: one or more blades capture the wind, like the panels of a windmill. 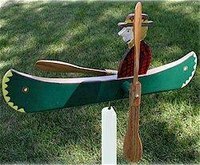 For simple whirligigs, the blades are part of the depiction--the moving canoe paddles, the legs of a frog or the wings of a bird. More sophisticated whirligigs have additional parts. For many, the blades are connected to a mechanical device, usually a simple piston-like rod. When the wind blows, the blades spin and cause the piston to move back and forth. The piston is in turn connected to the carvings at the end of the whirligig and pushes the arms or legs of the figures. As long as the wind blows or as long as someone is turning the blades, the whirligig will continue to move.